A perfect alternative to the more obvious crisp flavours. Smoky Bacon is another of Walkers most loved savoury treats. 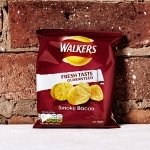 Whether it's a mid-morning snack, an accompaniment to your lunch, or something to munch in front of the television in the evening, Walkers Smokey Bacon crisps will always deliver the goods.